Name your adventure! You’ve travelled thousands of miles, and likely crossed the equator for the first time. It’s time to address the sensory overload that comes with arriving into the Galapagos. This is a bucket list adventure, so it’s time to start filling up the bucket with some unique and memorable adventures! 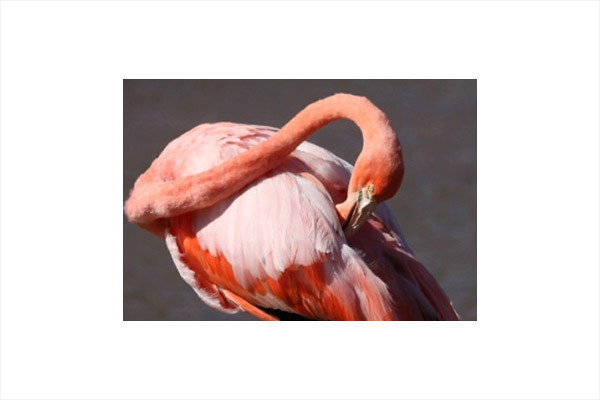 On the enchanted island of Isabela you can easily see 5 of the 7 sub – species of giant tortoise, flamingos, penguins, marine and land iguanas, sea lions and white tip reef sharks using the town of Puerto Villamil as your base. There is an incredible range of visitor sites and attractions close to Puerto Villamil that will allow you to enjoy the incredible beauty and tranquility of Isabela. Here you will find a variety of options that allow you to visit the many visitor sites while enjoying the unique flora and fauna of this enchanted island. Los Tintoreras are a small group of islands off the coast of Isabela that forms a series of sea channels where white tipped reef sharks doze and playful sea lion pups give chase. The Tintoreras Islets, located a short distance from Puerto Villamil, is home to a great variety of wildlife. 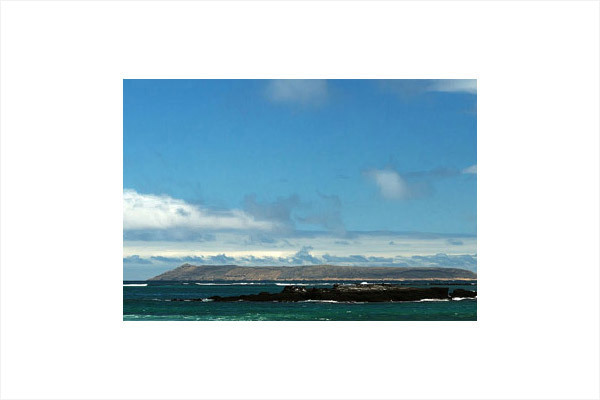 Its turquoise, crystalline waters are inhabited by white-tipped reef sharks, Galapagos penguins, marine turtles and sea lions. One of its beaches, surrounded by mangroves is one of the few sites where marine iguanas can reproduce successfully. 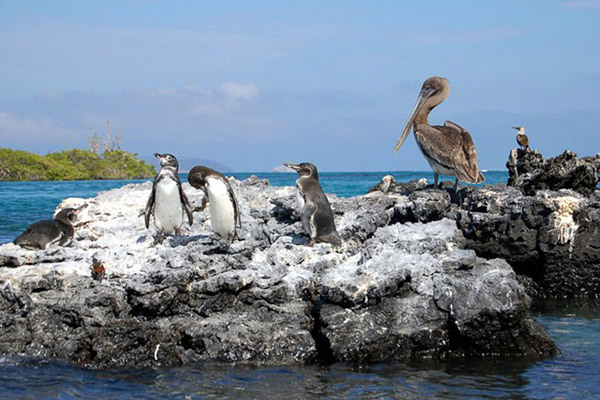 A magical place for observing the amazing marine wildlife of Isabela’s emerald green waters; marine iguanas and the Galapagos penguin can be seen here. The hotel’s local guide will lead you to the dock and on foot over a small bay onto the beach to Los Tintoreras. At the nearby sea lion colony you can snorkel in the water where newborn sea lions learn to swim amongst shoals of colorful fish. The access and walk path is easy, visitors may land in high tide as well as in low tide. It takes Half Day Tours Las Tintoreras approximately 10 minutes from Puerto Villamil dock to arrive to Tintoreras. 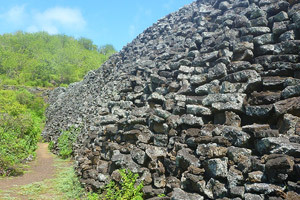 The eerie yet intriguing Muro de las Lagrimas is a ten meter high wall of lava rock, a sad reminder of Isabela’s history as a brutal penal colony from 1946 to 1959, where prisoner were forced to build the wall of sharp lava rock, as a punishment. The wall is so named for the many convicts that lost their life constructing it. Isabela was a penal colony from 1944 to 1959 when the prisoners rebelled, abducted a foreign yacht and escaped to the northern coast of Ecuador. This colony was famous for cruelty and torture practiced against the convicts. The “Wall of Tears” was constructed by inmates during this period, it is 5 to 6 meters tall by 3 meters wide and a length of approximately 100 meters. 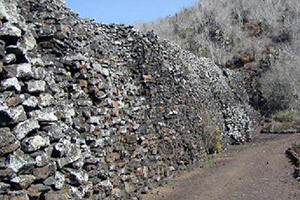 Its main feature shows thousands of lava rock stacked on each other without any cement to hold them together. 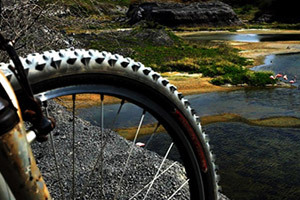 Los Humedales are the hidden treasure of Isabela; wetlands encompassing sandy beaches, rocky shores and mangroves. There are numerous trails leading to secluded beaches, natural pools, lava tunnels and possible encounters with Galapagos Tortoises released into the wild by the Isabela Breeding Centre. Marine wetlands in the bay of Puerto Villamil are protected from waves by lava flows and islets as a natural breakwater, which forms an area of calm water, sandy bottom of organic origin and certain parts with rocky substrates. Los Humedales is the best place in all of Galapagos for observing migratory birds: blue-winged teal, the greater and lesser yellowlegs, common tern and osprey to name a few. It is a walking tour or by bicicle. 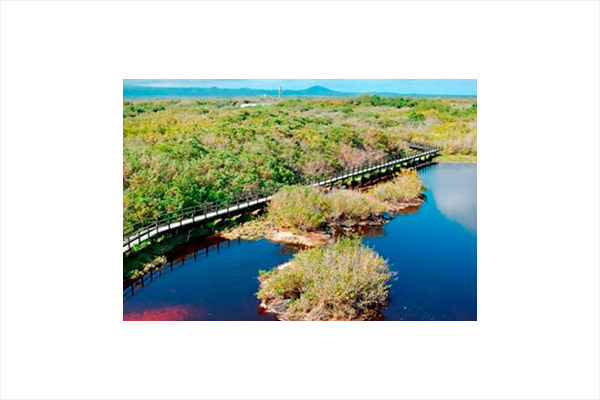 The Wetlands are coastal mangroves and brackish water lagoons shaped by seepage of seawater and freshwater underground tributaries coming from the upper parts of the island. They are also an important feeding area for the Galapagos penguin and one of the main nesting sites for green sea turtles. Los Tuneles is the epitome of Galapagos magic; the stuff of BBC / National Geographic documentaries. It’s a maze of lava arches inside the breakers with crystal clear water full of huge sea turtles (sometimes man-sized), eagle rays, sea lions, fish, white tipped reef sharks and more. Turtles navigate their own highway from the mangroves to the open sea through Los Tuneles.. 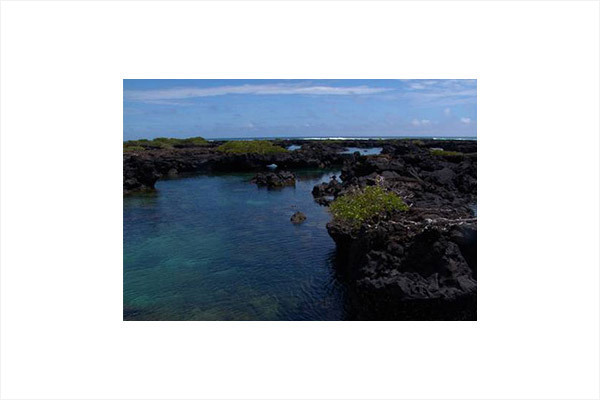 This site is one of the most spectacular places for snorkelling in Isabela as the water is shallow, clear and calm. This marine sanctuary is characterized by its unique geologic formations. A series of lava flows have produced a number of arches and tunnels both under and above water, where you find a number of animal species that have taken up residence in these magnificent formations. The entry into this site is shallow and the waves can be quite strong, for this reason it is not always feasible to enter this site. The best season to visit is between the months of January and May. 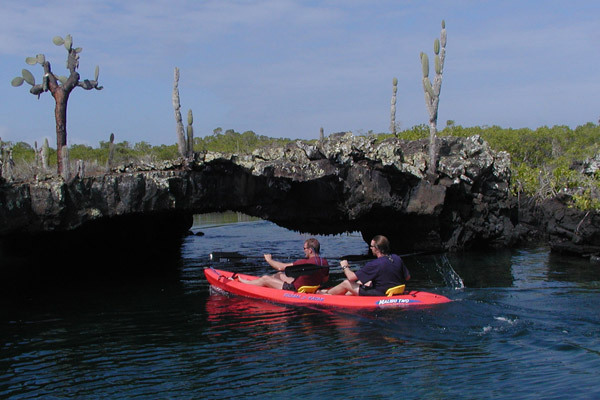 A 30 to 40 minute boat ride to a place where lava flow impacted with the oceans waves to form the stunning tubes and bridges of Los Tunneles. As soon as you get to the intertidal starting point you will be released to snorkel through this astoundingly beautiful site. A 30 minute fibra ride brings you to one of the Galapagos’ most spectacular marine site where you can dive or snorkel and enjoy the undersea world of Isabela’s waters. Here, usually you will have the chance to spot Mantas, Stingrays, Sea Turtles, White-Tipped Reef Sharks, King Angelfish, Yellowtail Surgeonfish, Barberfish, Blue-Chin Parrotfish, Bumphead Parrotfish, Galapagos Groupers, Galapagos Sheephead, Harlequin Wrasse, Grey Grunts, Corals, Tubes and more. If your lucky, you’ll encounter the fascinating and beautiful Galapagos Seahorse. 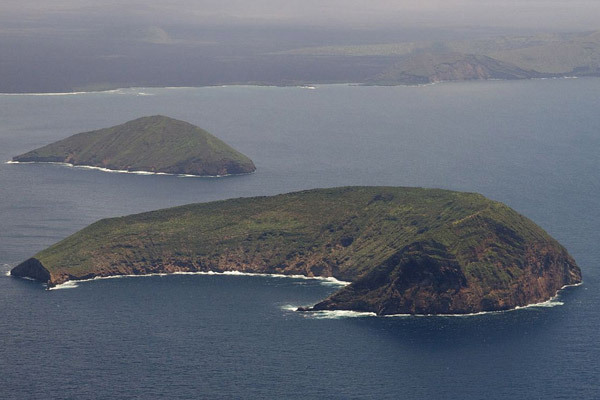 Isla Tortuga lies off the southeastern side of Isabela, the remnants of a volcano with one side resembling half a caldera creating a crescent shaped lagoon. It is approximately 30 minutes from port. Los Cuatro Hermanos are four rock outcroppings that lie to the north-northeast of Isla Tortuga. Some come here not to snorkel or dive, but rather to admire the many frigates, blue-footed boobies, tropic birds and other sea birds that nest on the island. Underneath, however, it is a beautiful seascape teaming with marine life. Either way, it’s a experience not to miss.